Autumn brings many delights: colorful leaves, pumpkin-spiced everything, a reprieve from the heat of summer. For pets with allergies, however, a change in season can also mean the onset of uncomfortable itching and skin infections. Pets with environmental allergies, known as atopic dermatitis or atopy, can have symptoms limited to one season or can suffer year-round. “Animals can also be allergic to plants that pollinate in other seasons, including trees (springtime) and grasses (summer), as well as things that are in the environment all year round, such as house-dust mites and molds,” Dr. Coyner explains. 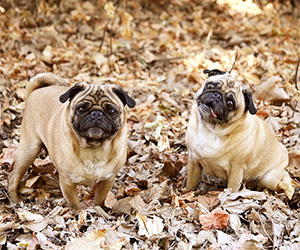 While inhaled allergens can create issues for the pet’s skin from inside the pet, those same pollens can also be causing damage from the outside. “Pollen grains are not only inhaled; they settle on the skin and fur and then trigger allergic reactions on the skin,” Dr. Coyner says. Atopy can be suffered by both pets and people. Itchy skin is the primary symptom noticed by owners, but more common signs of allergic disease are itchy ears and recurrent ear infections, Dr. Coyner says. Recurrent ear infections secondary to atopy can occur even in the absence of any other signs of allergic disease, so many owners continue to treat the regular episodes without realizing there is an underlying cause that could be addressed. For owners struggling to manage a pet with seasonal allergies, the good news is plenty of options exist. The first step is a veterinary evaluation to ensure the pet doesn’t have a secondary bacterial infection that requires antibiotics. Most veterinarians start with milder drugs and work their way up if the medications aren’t doing the trick. Though many pets respond to shampoos and antihistamines, more severely affected pets might require stronger therapies. Either immunosuppressants, such as cyclosporine, or desensitization therapy (injections or oral drops, which contain small amounts of what the pet is allergic to in order to retune the immune system) are often employed. Eliminating the symptoms of an allergic disease is the primary concern for owners, however, veterinary dermatologists such as Dr. Coyner regularly perform allergy testing on pets to identify specific allergy triggers. Knowing the specific culprit can help owners minimize exposure of the allergen and reduce the pet’s symptoms. “Allergy testing and desensitization therapy can often be helpful to identify and treat the underlying cause of the itch, and reduce the need for symptomatic drugs,” Dr. Coyner says. With so many options available, there’s no need for your pet to itch and scratch his way through fall (or any season for that matter). If you’ve noticed a sudden onset of signs of allergic disease, head on over to the vet for a consultation.